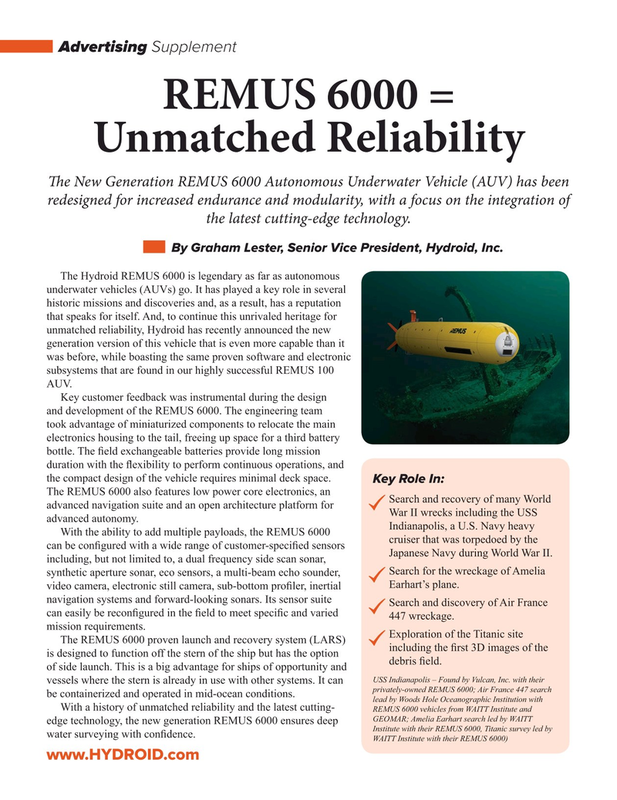 Te New Generation REMUS 6000 Autonomous Underwater Vehicle (AUV) has been redesigned for increased endurance and modularity, with a focus on the integration of the latest cutting-edge technology. By Graham Lester, Senior Vice President, Hydroid, Inc.
GXUDWLRQZLWKWKHÀH[LELOLW\WRSHUIRUPFRQWLQXRXVRSHUDWLRQVDQG the compact design of the vehicle requires minimal deck space. War II wrecks including the USS advanced autonomy. Japanese Navy during World War II. FDQHDVLO\EHUHFRQ¿JXUHGLQWKH¿HOGWRPHHWVSHFL¿FDQGYDULHG 447 wreckage. mission requirements.